The Fourth of July is one of our favorite holidays for a plethora of reasons. Between looking up in awe at the night sky full of fireworks and stars, laughing with friends and family, basking in the balmy summer night weather, and gathering with festive communities, it's hard to choose just one highlight. Scratch that—as much as we love all the aforementioned traditions, our true delight is huddling around the dessert table. 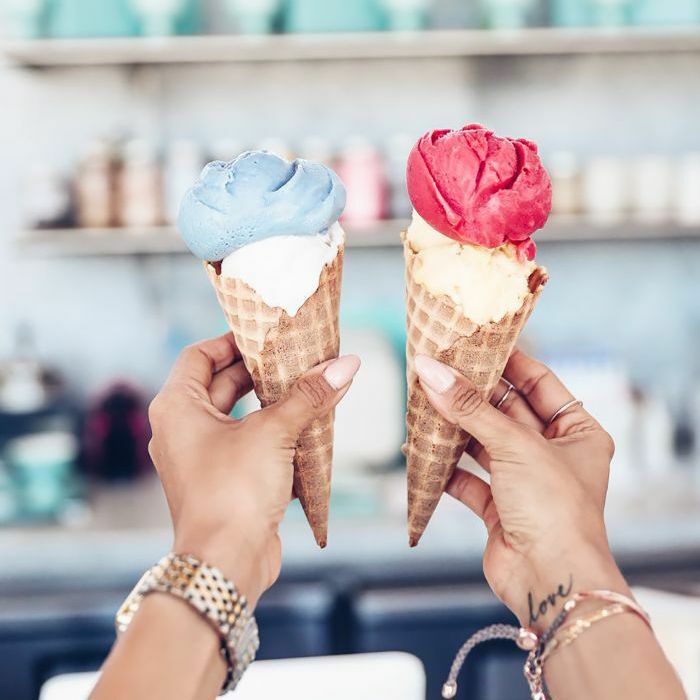 Since no Independence Day festivity is complete without plenty of sweet treats on deck, we rounded up the best Fourth of July dessert recipes to try this year. From vegan ice cream sundaes to pies and cocktail floats, there's a little something for everyone. We also made sure to include some that simply remind us of summer as well as those that are getting pretty into the theme and color scheme. Even if downing a table full of sweets isn't up your alley, this roundup of eight Fourth of July dessert recipes is a menu must. So if you're hosting a barbecue or get-together, your bakeathon awaits you below. Scroll through to see which Fourth of July dessert you want to make to celebrate America's birthday. Vanilla buttercream cupcakes are perfect year-round, but we particularly love Spoon Fork Bacon's Fourth of July take on the classic recipe. You can follow a simple buttercream frosting recipe of your choice, or start from scratch and use whatever base and frosting recipes you like if you simply want to adopt this decorating technique. Just drop a raspberry or blueberry on top and create an almond crown around the fruit for good measure. A sundae in a jar is not only charming but also practical and convenient when you're hosting a big celebration. It makes serving a lot easier, and your guests will think these desserts are adorable and delicious. What they may not pick up on, however, is that these gooey peanut butter caramel treats from The First Mess are also pretty healthy and completely vegan. Even better? No ice cream maker required. You may have noticed that we have a thing for minaitures, especially mini desserts. And since nothing is more American than apple pie, we're pretty stoked about this recipe from Half Baked Harvest. These salted and caramelized mini apple hand pies are a creative take on the classic recipe. Just add a dollop of vanilla ice cream to enjoy this cinnamon-sprinkled delight of a dish. Part cocktail, part dessert, part decoration, this margarita float recipe from Half Baked Harvest gives you everything you need for a Fourth of July shindig in one glass. So if you want to get super into the theme, here's your chance to do it right. Inspired by firecrackers and sparklers, these berry beverages taste just as good as they look. This strawberry shortcake recipe from The Minimalist Baker gives the sweet summer staple a healthy twist. Both vegan-friendly and gluten-free, it will satisfy your belly while also allowing you to accommodate dietary restrictions. With silky-smooth coconut buttermilk, fresh strawberries, and a flaky, buttery base, you'd never know this recipe deviates from the classic formula. This lovely treat is called a dream bar for a reason—those whimsical flecks of purple, blue, pink, and red make them thoroughly dreamy. Brought to us by Wu Haus, whip these up if you're looking for a Fourth of July dessert option for vegans (though non-vegans will devour, them, too). Start early and indulge in dessert for breakfast with these light and citrusy lemon berry crepes. These sweet morning treats are brought to us by Salt and Wind, so you know they're going to be crowd pleasers. If you love chocolate, then these double–chocolate chip cookie ice cream sandwiches will blow your mind. This recipe from Foodie Crush points out that pretty much any flavor of ice cream will go well with chocolate. Feel free to get creative; the pint is the limit! And if you can't pick just one flavor of ice cream, even better, because alternating between a few will give your guests plenty of options. And now, shop chic Fourth of July décor to elevate your dessert spread.